We have visited the story of Judith frequently this year and there is much to be learned from the narrative as she enacts sublime fidelity and heroic love. A favorite Noontime reflection on the Book of Judith may interest you. It is linked to the Favorites page above, or through the Pagesnavigation panel in the right-hand column of this blog. Just yesterday we reflected on the concept of fasting. Today we see Judith set aside her sackcloth and ashes to break her mourning; she goes out to face the enemy, armed with her woman’s weapons of beauty and speech. Judith will save a nation . . . and she will do this by first seeking and then living in God. She will receive God’s favor . . . and she will become the vehicle of a people’s salvation. We notice that God is central in every decision Judith makes and in every act she performs. 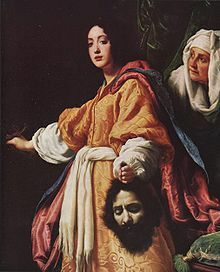 Judith is able to escape the enemy’s revenge by walking past the sentries with her maid – and with the head of Holofernes hidden in their food pouch – precisely because she and her companion have walked out each night to pray at the ravine of Bethulia. The guards are accustomed to seeing this regular ritual and so do not intercept the two women; they do not even search the food pouch. After bathing each evening, Judith seeks God’s help . . . and she receives it. We watch Judith as she leaves the city of Bethulia – a city which has provided her people safety and is now threatened by the Assyrian enemy: Order the gate of the city opened for me, that I might go to carry out the business we discussed” . . . Judith and her maid went out . . . When we are called to go out of our comfort zone we are frightened. We tell God that he has chosen the wrong emissary. We say that we are too consumed with all the many other tasks he has assigned to us. We find reasoning and excuses for not doing God’s will and yet . . . when we pray as Judith does, when we develop steadfastness as Judith has, when we trust God and take each step as it comes to us rather than worry about the distant future, we are able to rejoice – as Judith does – in the favor God bestows on her. And so we pray . . .
Good and holy God, we are both fear-filled and awestruck at your power. We watch as Judith goes into the very heart of the enemy camp – for this is where you need her – and we worry that we will not be able to slay the enemy in your name as Judith does. We watch Holofernes and his soldiers set Judith in a place of honor – knowing that these acts come from lust – and we worry that we may not be as clever as Judith is. Give us the courage to remain faithful to you. Give us the endurance to wait on your plan. Give us the prudence and patience to allow you to unfold before us, through us, and in us . . . so that we, like Judith, may rejoice in you. Amen. A re-post from August 13, 2011. Judith teaches us about courage, fidelity, and divine providence. She shows us clearly the strength of women, the power of faithfulness through duress, the results of steady, enduring, immutability . . . and the gift of God’s abiding presence. Judith instructs us on the results of constancy and the privilege of discipleship. In this particular chapter, we see Judith carry out the final stages of her plan . . . and I am always intrigued by the fact that none of Holofernes’ soldiers see anything suspicious about two women leaving the camp and the reason for this is that from the first night of her stay Judith makes it clear that she and her maid will go out to pray each evening. For this reason their escape route is made through their accustomed daily commitment to God (12:5-9). It is also clear that Holofernes’ principle error is seeing women as sexual objects. The heart of Holofernes was in rapture over her, and his spirit was shaken. He was burning with the desire to possess her, for he had been biding his time to seduce her from the day he saw her. (12:16) Neither this man – nor anyone in his inner circle – sees the true significance of the presence of this quiet, beautiful, spiritual woman in their midst. And they pay for this blindness with the loss of life and the loss of the campaign they have planned against the people of Bethulia. What can we learn from this today? How can we take this lesson into our own lives and honor it? What is it about Judith’s conduct that speaks of her so well? This story – when read from beginning to end – is full of unexpected twists. And so is life. This story – when we take the time to examine it more fully – can startle us and even repel us with its stark reality and violence. And so can life. This story – when reflected upon in the context of the coming of Christ – brings us the expectation of restoration, justice and joy. And so does life. This story brings us the gift of constancy, a gift we receive through our own discipleship. What do we do against life’s twists and turns and ironies? We remain constant, we abide with God, we fear less and we pray endlessly. We empty ourselves of ego and pride . . . and we allow God to complete and fill us. We act – just as Judith did – from a custom of constantly walking and praying with God. Good, merciful and just Creator, we place ourselves in your hands each day at our rising. We carry you with us throughout each day. We return to you each evening just as we return to family, home and hearth. Abide with us this day and all days, just as you accompanied Judith and her maid into the enemy’s camp. Abide with us each evening as we walk out to the ravine to pray with you, just as Judith and her maid were accustomed to doing. We seek you, just as Judith sought you. We bring to you our worries and fears, just as these women did. May we too remain constant to you in our prayers and in our actions. May we too know the triumph and the peace which comes from abiding with you. We ask this in Jesus’ name. Amen. If you have time to read more about Judith’s story and reflect on her importance in our lives today, enter her name in the search box on this blog and spend time with her. Or open your Bible to this book and begin her story in Judith 8. For background, and to better understand the context, begin reading from Chapter 1. 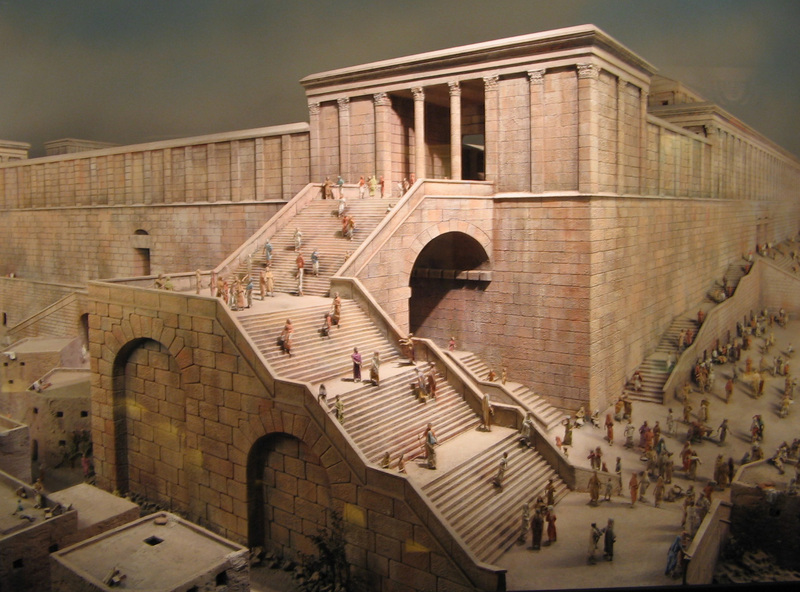 For an online commentary, click on the model of ancient Jerusalem above. First written on July 27, 2008. Re-written and posted today as a Favorite.